Have you ever heard the sound of silence? It’s a sensation that’s so powerful it will make your brain numb. For hours I had be listening to the silence as I drifted in and out of states of consciousness and dreaming. By this point, I can’t even tell if I’m even awake or asleep anymore. Through closed eyelids I see a soft glow. My fingers scramble along the top of the bivy sack until I find the zip, open the cocoon and stick my head out. My face is damp with perception and the first hit of freezing air stings. The sun glows over a snow white mountain ridge, casting pastel pink, yellow and purple colors that paint the sky. To my right lies my boyfriend Antonio and to the other side, four of my newest friends tucked into their bivies. I wake them up to see nature’s impressive light show. 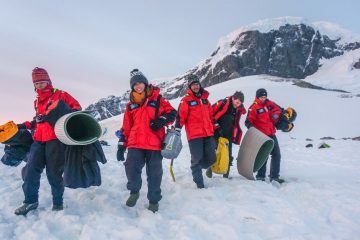 We all have ear to ear grins on our faces knowing that we had just spent the night in the coldest place on Earth, Antarctica. Our journey to 7th Continent began in a town that claims to be the “End of the World” – Ushuaia, Argentina. But, of course that isn’t true. It would be the converted Russian research vessel, the Akademic Ioffe, staffed by One Ocean Expeditions that would take us to the real end. The Ioffe navigates through the Beagle Channel until it leaves its shelter and hits the open seas of the infamous Drake Passage. As the ship lulls over the waves, rocking left to right, I begin to realize why the furniture is bolted to the floor. There’s no average demographic. The ages range from teenagers on holiday with their parents to intrepid seniors well into their 80’s. Here in the Southern Ocean, winds and waves circle the globe with no land to break their momentum, making this 500 mile stretch of water one of the stormiest sea in the world. Despite the hype, the dreaded “Drake Shake” never comes and the sea remains mellow. During the crossing, the One Ocean staff keeps us entertained with presentations and briefings. In between eating four course meals and exploring our floating home, we get to know our fellow shipmates. There are relatively few passengers on board, just under 100. There’s a buzz in the air, everyone excited about what lies ahead. On our voyage, there’s no average demographic. The ages range from teenagers on holiday with their parents to intrepid seniors well into their 80’s. Also, every continent is represented. While the passengers aboard the Ioffe are diverse, it is the spirit of adventure that binds us together. 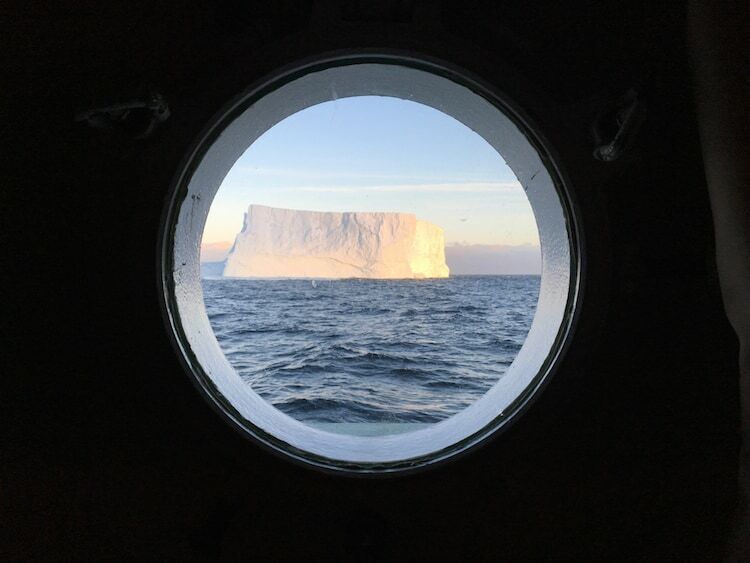 After two days on the open seas, we awake to look out our bedroom porthole to see a whole lot of icebergs floating by. We had made it to the Antarctic Peninsula. The landscape here is dramatic, extreme and beautiful. The Peninsula is an extension of the Andes Mountain Range and tall peaks jet out from the shore and scrape the sky. Sheer cliffs plunge into the sea, glaciers hang onto mountain slopes and tabular icebergs the size of buildings float past the ship. 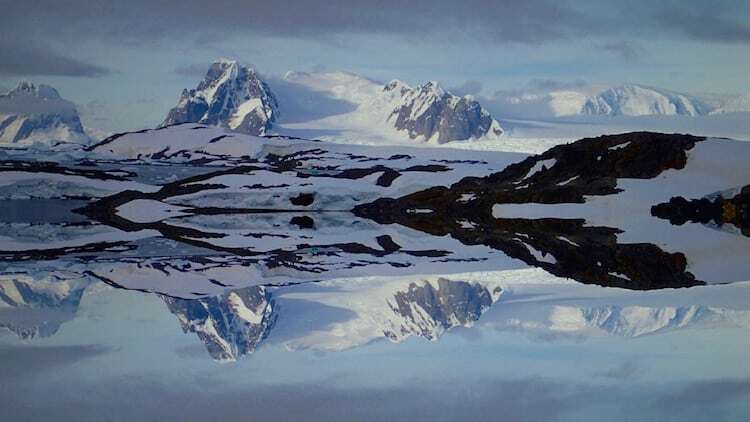 There’s two ways to get up close to Antarctica. The first is an inflatable zodiac. The second is a kayak. We chose the latter. We propel ourselves through the polar landscape as the bow of the kayak chomps through the ice and enjoy the sensation of being in such a surreal place. 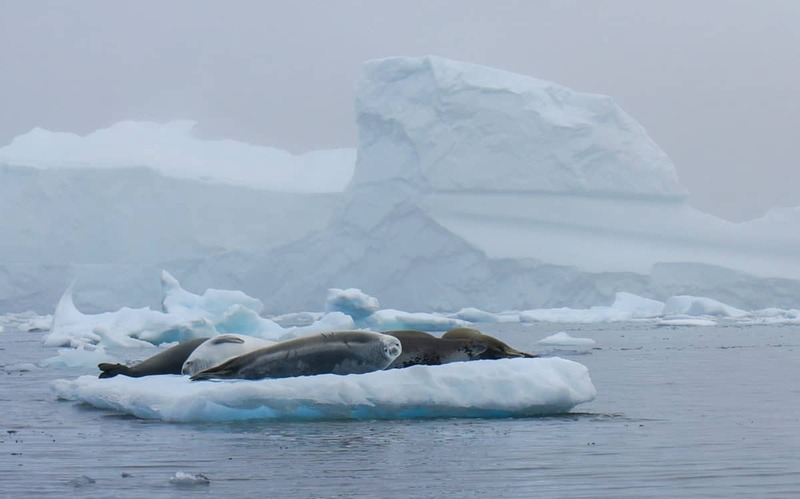 We spot our first Antarctic wildlife, a group of seals. They yawn and lazily plunge into the water. Kayaking in Antarctica is like paddling through an ice sculpture park with its never ending colossal and magical formations that make arches. 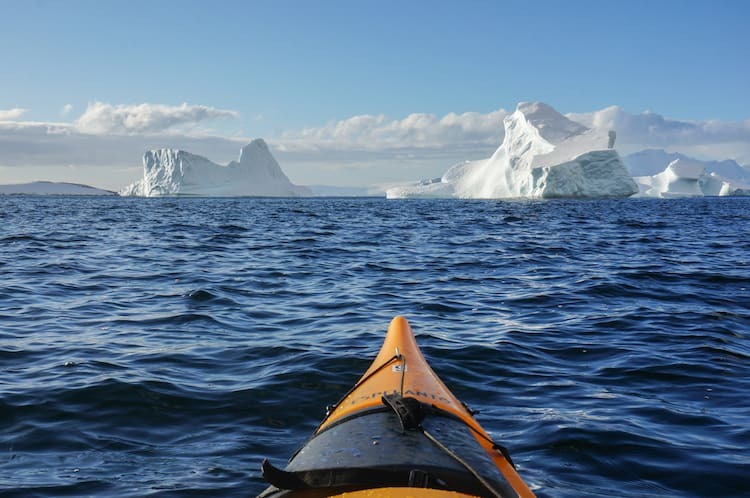 Kayaking in Antarctica is like paddling through an ice sculpture park with its never ending colossal and magical formations that make arches. There’s sounds of a chorus of squawking penguins in the distance. 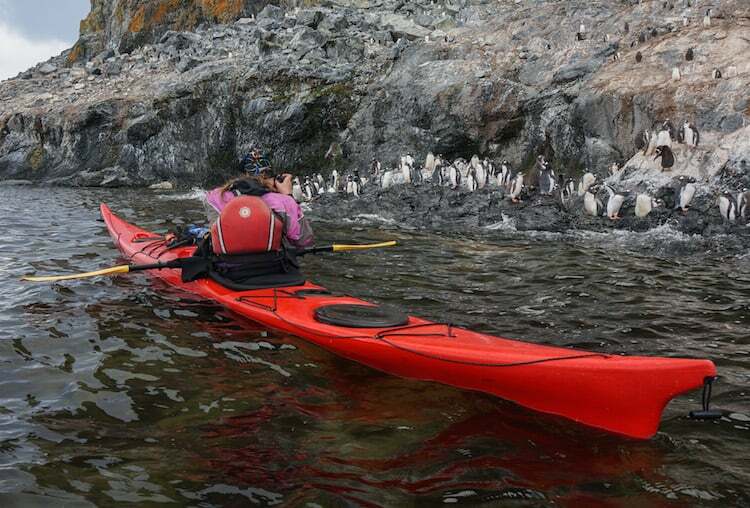 We paddle faster in excitement to see some of Antarctica’s most famous residents. A penguin rookery is a cross between a commune and a kindergarten. The first whiff of this place had us wishing we hadn’t been in such a hurry to arrive. The guano (aka penguin poop) smell is best described by Jason Orfanon, an NPR Science producer who says it resembles old cigarette tobacco soaked in ammonia, mixed with rotten shrimp and left in the sun for days. The cuteness of these wobbly tuxedo wearing creatures makes up for the stench. Penguins aren’t sacred of anyone, they just march around and do their thing. For humans, there’s a 5 meter rule which makes sure you don’t get too close. However these little guys clearly are oblivious to it because they love to come right up to us. We’re here in March and the chicks that have hatched a few months ago and are now fluffy with their in between adult and chick feathers. 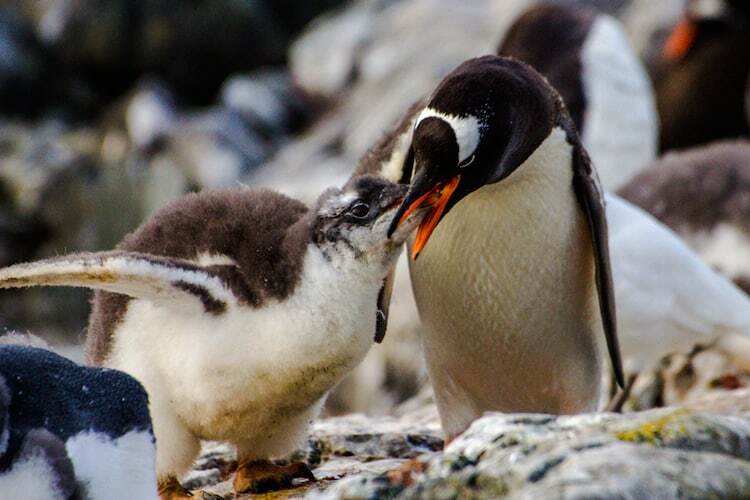 One chick comes screaming through the group (caaa, caaa)..which translates to “Moooom, I’m hungry” because soon enough a penguin waddles up to the baby and begins to regurgitate fresh fish and krill into the baby’s mouth (yum). 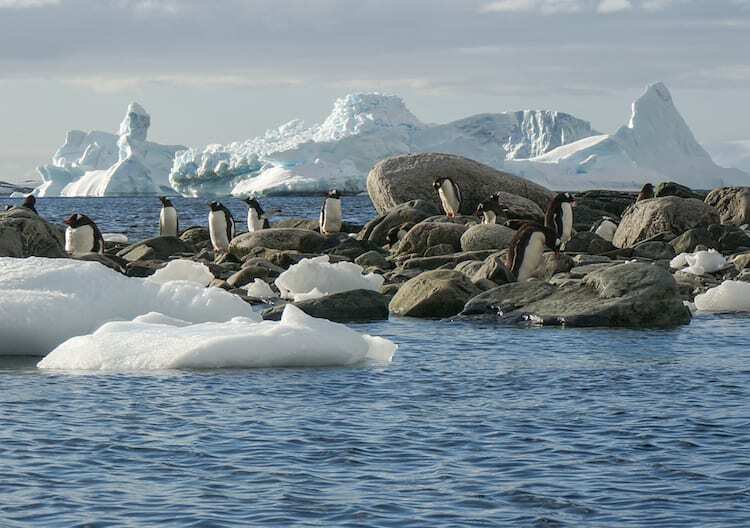 The weather in Antarctica is extremely unpredictable. For the first few days a grey haze hung in the air but then it cleared. 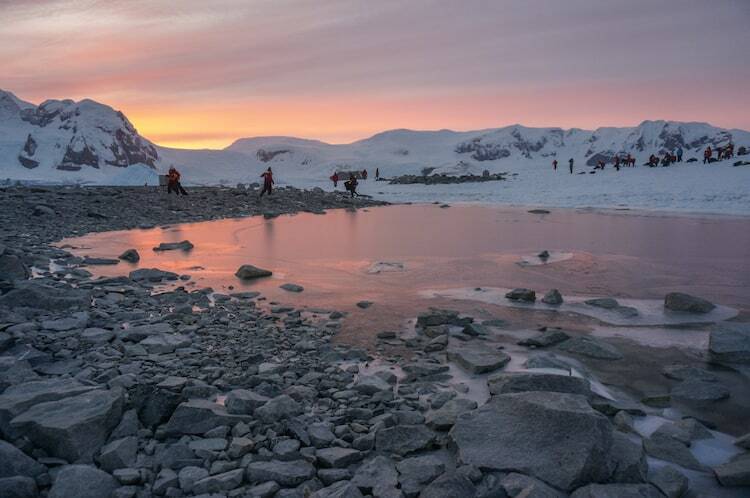 When the sunshines in Antarctica the landscape glitters like a fairytale and the scene is painted with pure white snow, turquoise blue glaciers, deep blue sea and jet black mountains. 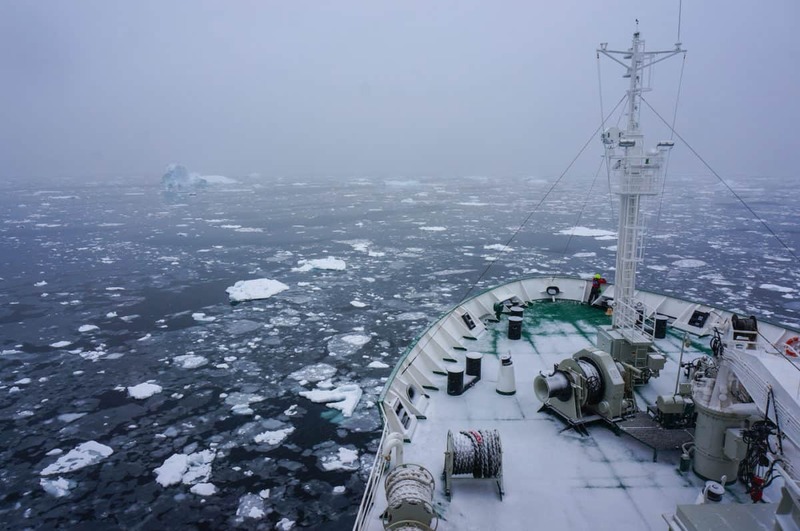 As we sail the seas surrounding the Antarctic Peninsula, time warps. The days seem to double in length and blur into one another. There’s 2 excursions a day with 3 meals in between and a lot of activities. It’s eat, explore, eat, explore, eat, sleep, repeat. There’s 2 excursions a day with 3 meals in between and a lot of activities. It’s eat, explore, eat, explore, eat, sleep, repeat. But not all of the excursions are to spot wildlife and ice, some show you the human side of this inhuman place. “Hello! Welcome to Vernadsky Station, please come”, Sasha, a rosy cheeked smiling Ukrainian meteorologist greeted us. We followed him up the snowy steps and into the main building. As we walked through the halls of the base Sasha points out the labs, dorm rooms and gym. Everything crammed in. The 12 person, all male crew that mans the station spends the winter here. In just a few months the sea will freeze over and Vernadsky, like the many other research bases that are dotted around the continent, will become as isolated as a space station. We came to the end of the tour and there was an opportunity to send a postcard. I picked one out and sat down to write to my parents. It was the most difficult postcard I’ve ever written. First because my dry suit constricted my arm, making it look like it was written by a kindergartener. An second because how do you describe a place that is so wild and pure to someone who has never seen it in just a few lines? I was at a loss for meaningful adjectives and all of my choices came up short. What I really wanted to tell them was the feeling of Antarctica. That the pure and pristine state of this place helps you focus on the things that really matter. Here there is so much striped away that you begin to lose sight of the the outside world. There are no cars, skyscrapers, cell phones, politics or even keys. The simplicity of life brings a clarity that is exhilarating. In a society that is more disconnected then ever, coming here brings back my faith in humanity. My fellow ship mates start to feel like a giant family sharing a special moment together. Being present and in the moment becomes natural again. It’s a beautiful thing. Jared, the resident marine mammal specialist spots a humpback calf from the bridge and invites the everyone up to come and watch. It’s March, late summer here in Antarctic and a lot of the sea ice has melted which makes it prime time for whale spotting. Jared, the resident marine mammal specialist spots a humpback calf from the bridge and invites the everyone up to come and watch. 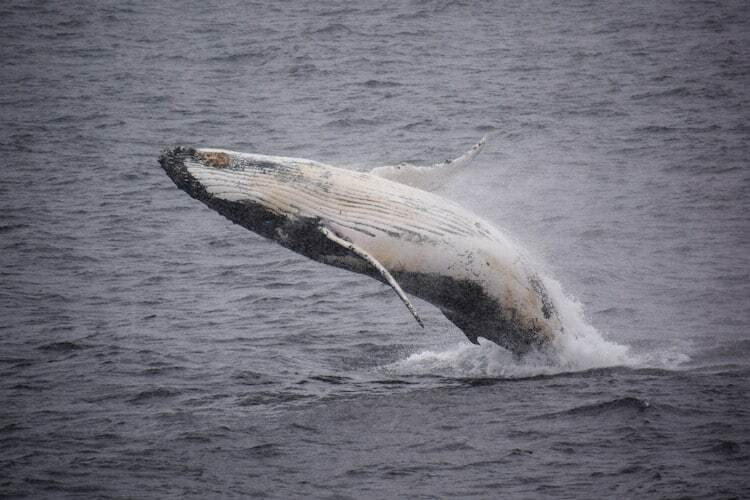 The whale jumps and does acrobatic spins off the starboard side of the ship. He keeps at it for long enough that the captain even decides to slow down the ship so everyone can get a better look at the creature. 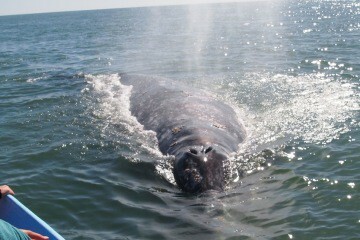 He continued to breach and follow the Ioffe for over an hour. After the last excursion was over we prepare to hit the open seas again. There are two full days of ship life ahead of us. This time was the perfect opportunity to reflect and absorb the enormity of what we had just experienced before being bombarded by the chaos of civilization. We make it back to Ushuaia and the Ioffe pulls into harbor. As I step off the ship onto the dock I realize that I’m coming back with much more than just photos and good memories. Antarctica is a place that had been ingrained inside of me. The White Continent is no longer just a Planet Earth clip. 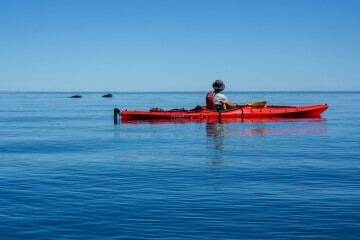 I’ve felt the frigid air on my skin, paddled through the landscapes and heard its silence. This journey proved to be one of the most incredible adventures of my life. And, like all great adventures, I walked away feeling a true connection with this wild place at the end of the world called Antarctica. The Grey Whale Migration, Mexico.